I have been thinking recently about how being a research-intensive academic in science (I will qualify with many fields, but realize not all are like this) is like being a pop music star. 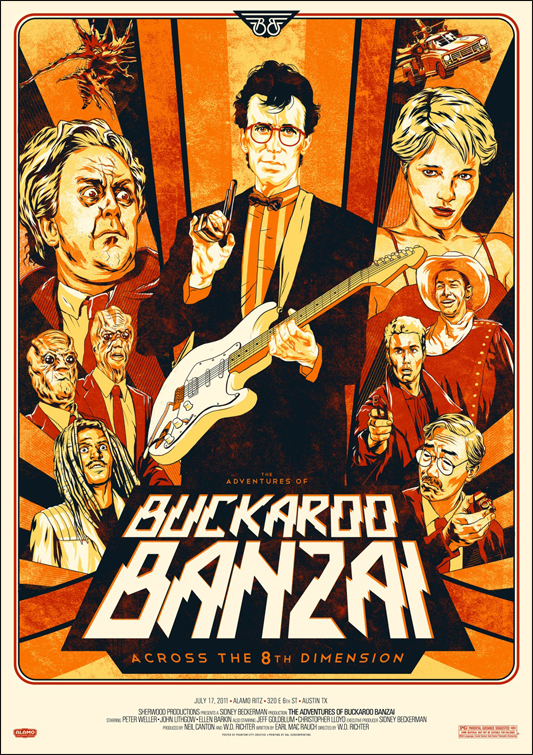 Now, you may be scoffing and getting ready to stop reading this post, or you may immediately think of Buckaroo Banzai, so hear me out. I think that this analogy can go pretty far and actually has merit. Further, I hope that by making this analogy, I can help some of you come to terms with different aspects of this career path. For instance, if you are part of the postdoc army and thinking you want to be a faculty member, thinking about being a research-intensive academic in this light might help you to position yourself better to become a professor. Scientists and Musicians are both creative. I know it is obvious that pop stars and musicians are creative because they make up new lyrics and guitar rifts that are catchy and moving. But, scientists are inherently creative, too. Our entire job is to solve new problems that have never been tackled before. We invent new techniques to observe, analyze, model, and describe the phenomena of the world around us. I think that there is some idea that what we do is not creative because it is often opaque, uses math, and results in facts and new knowledge. On that note, there is another issue, too. By the time we present our results (perhaps on NPR, if we are cool), we are telling you some new facts. But, we don’t capture and retell all the creative moments it took us to get to these new facts. We don’t advertise very well that science is creative. Scientists and Musicians are influenced by the past and present of the field. In music, it is clear that there are trends in sound (remember auto-tuning?) and rehashing of old sounds to make them new again (sampling and covers). Scientists need to be pushing forward while constantly keeping the literature of the past and present in mind. Previous experiments and results help us to find the path on our future experiments. Referencing the literature is the first thing we do in journal articles. Further, some of our intellectual work is in the form of review articles where we completely rehash the literature in new ways, trying to make connections between what has come before with what is happening in a field now. Finally, every now and then, a field will “rediscover” a whole type of experiments or model that was basically ignored or dead to completely revive these ideas to have significant impacts on a field. Scientists and Musicians both have to re-invent themselves every couple of years. Part of being creative is pushing yourself to be creative about new things. Musicians come out with new albums every few years. Many times the sound is new and they even re-invent themselves. If they are good at it, a pop star can have a 30 – 40 year career or longer (think about Madonna or the Rolling Stones). A typical tenured and continuously active (see below) scientist will have at least 30 years of productivity in their career. Over 30 years, there is no way to continue to do the exact same thing. A scientist must re-invent themselves every few years to continue to come out with new ideas, results, and papers. So, it is not enough to have an idea of what the next experiment is, you must think about what the next big idea that will result in 5-10 or 20 papers. Then you must give it up and move on to the next, next big thing. To be truly excellent, you should be inventing fields that hit and riding the wave of popularity – not following it. Of course, there is merit to studying one thing really well, but even in that, you should be applying new techniques and learning about new avenues, or else there will be nothing new to study. Scientists and Musicians have a public face and profile to maintain. In my “state of the lab” address (post, post, post), I call myself the CEO of the lab. Much like a pop star, you have a public face that you present that needs to be maintained. In addition to being the “front-(wo)man” of the lab, I am also the manager. I maintain my lab website. I make sure that our great achievements are properly advertised. I make sure we are seen at all the right venues (parties for pop stars and conferences for scientists). Scientists and Musicians both have to go on tour. In order to both maintain their public profile and to promote their new work (album or results/papers), musicians and scientists both have to travel. Musicians can also make money on their travels because touring is the best way for musicians to make money these days. For scientists, some fields do pay honorariums for giving talks, but usually you just get your travel paid for (reimbursed). Around tenure time, many people go on a “tenure tour.” I am not an advocate of the tenure tour. In my mind, by that time, it is too late. You should be touring all the time to promote yourself, your work, and your personnel and students consistently. Scientists and Musicians often marry others in their field. Musicians often marry other musicians, artists, actors, or similar creative types. Scientists often marry other scientists. This can make touring and work-life balance difficult (see next item). At least musicians can make music wherever they want. To do science, you must be at a university or research institute. There are not an unlimited number of open slots at these locations. There are very few (I have met one only) self-employed scientists. There are many, many self-employed musicians, and you can live wherever you find inspiration, if you are self-employed. So, this ended up being a similarity that resulted in a huge difference. Scientists and Musicians have to juggle work and family. With all this touring and creating, it can be difficult for pop stars and scientists to have kids, juggle their jobs, and get to PTO meetings. Also, creative jobs are often all-consuming. Creative types, when engrossed in the creative process, often have a hard time putting their jobs to bed at night. This also makes work-life balance difficult. Scientists and Musicians are both mostly men and there is a glass ceiling. Many of the top pop stars are women, and certainly being a woman in music is more socially normal than being a woman in many scientific and engineering fields. That being said, there are few women in the Rock-N-Roll Hall of Fame (salon). Beyonce is not remarked to be a marketing and musical genius (although I think she is) (Atlantic). How many women in rap can you name? (girl talk, smithsonian) I won’t rehash all the literature about the fact that there are very few women in STEM, but I’m just saying – women musicians and women scientists all live in the same male-dominated society and are fighting a lot harder for the recognition they deserve. Scientists and Musicians collaborate. Musicians naturally collaborate to make their music. Most obvious are musicians in bands, but even solo artists work with musicians, producers, and sound mixers. In science, very few papers are single-author. As a PI, I always have my students and technician on the paper. This is the equivalent to the band and support. In addition, the duet is making a comeback in pop music and people have always sung together with people in different bands. Similarly, scientific collaborations are common, frequent, and often changing. This is because working with new people can be intellectually invigorating and enable you to recharge your creative spirit. Scientists and Musicians set their own schedules daily, monthly, yearly, career-wide. Just like some pop artists are one-hit-wonders, there are a number of scientists out there who basically only did one thing. A pop artist with a one-hit-wonder might be able to live off the royalties for their whole lives (maybe not so much anymore with pirating music), just as a one-hit scientist can get tenure and hang around forever living off their singular accomplishment. In both science and music, one-hit-wonders are not well-respected… I’m just saying. Scientists and Musicians can both be “night people.” There are very few fields in the world where waking up late and working to the wee hours of the evening is a plus, but both musicians and scientists can definitely do this. For musicians where you might be taking the stage at 10pm, it is a must. For scientists, it isn’t a requirement, but seems to be very popular. In fact, as a morning person, I feel like a huge slacker compared to HusbandOfScience, who can work on real science all night. All I can do is write blog articles with millions of typos. So, have I convinced you? Did I miss anything? Add it via a comment or send me a post of your own! If you want to be a tenure-track professor, are you thinking of the job in these terms? To get an email every time I post, push the +Follow button.